A good plant family for any keen forager to get to grips with is the mint (lamiaceae). Ground ivy (Glechoma hederacea). Thought to originate from the Mediterranean and western Asia, it has a long history of human use and, amongst a few other plants, was popular in medieval times for flavouring and clarifying ale- hence one of its colloquial names, ale hoof. The 'hoof' bit probably comes, with a bit of imagination, from its roughly hoof shaped leaf. The young leaves added in moderation to a salad give an interesting bite. 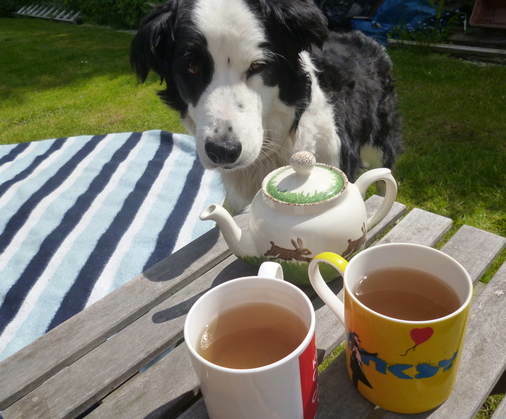 But it’s best use is probably as a simple infusion in hot water- providing a sharp and refreshing drink. A little bit of honey compliments it nicely. While the Chinese, who use it in various herbal medicines, add liquorice to it. Traditionally, many of the mint family are excellent cooling and calming herbs. 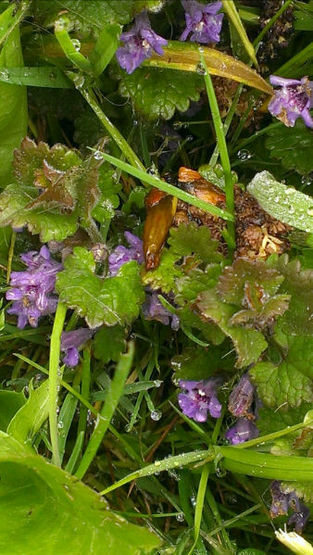 Amongst other things they have a reputation for aiding digestion after a meal and easing any inflammation of the mucous membranes- Ground ivy, in particular, is an anticatarrhal, decongestant and expectorant which basically means it helps to thin the mucus and expel it from the body. Similar to pine needles, which we covered a few posts back, if you take a deep inhalation of the crushed leaves you may notice a cooling and opening of the sinuses. A very common characteristic of the lamiaceae family is a square and usually hollow stem with stalked leaves that are opposite to one another and often slightly hairy. They are also usually rich in volatile oils which gives them their strong slightly sharp smell- if you have some common mint or peppermint growing in the garden pick a bit and have a look. Or, for that matter, basil, rosemary, lavender or marjoram which are all relatives that have been bought into common cultivation. At this time of year, the purple flowers are also a helpful guide. There are no obvious poisonous lookalikes, indeed, as far as I can find out there are no poisionous members of the mint family- which is not the same as saying that they all taste good! Traditionally, May is considered peak time for picking for medicinal uses, however our cold spring actually means the plant is at it’s peak about now. 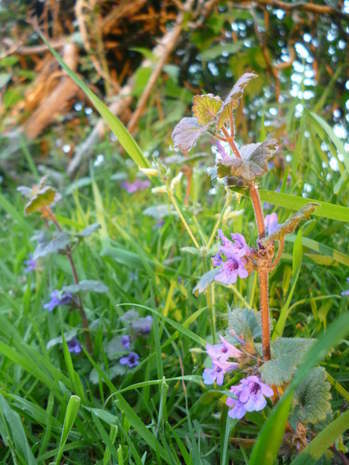 Never the less, for a simple infusion, ground ivy can easily be found from mid-spring right through to late autumn. Alternatively it can be picked and dried to last all year. Look for sunny banks and woodland edges on most soils. Incidentally, this is not related to ivy which is generally considered poisonous. * Good wild plant guides often come with a key which can be really useful for those with patience!